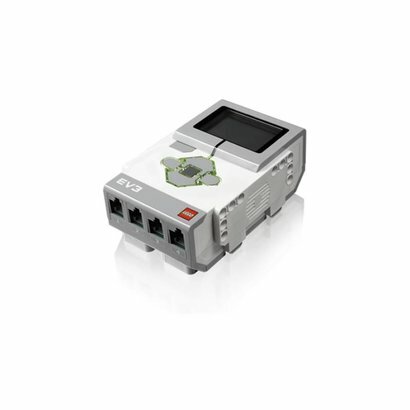 This programmable, intelligent brick serves as the heart and brain of LEGO® MINDSTORMS® Education EV3 robots. It features an illuminated six-button interface that changes color to indicate the brick's active state, a high-resolution black and white display, built-in speaker, USB port, a mini SD card reader, four input ports and four output ports. The brick also supports USB, Bluetooth and WiFi communication (NETGEAR WiFi dongle WNA1100 Wireless-N 150) communication with a computer and has a programming interface that enables programming and data logging directly onto the brick. It is compatible with mobile devices and is powered by AA batteries or the EV3 Rechargeable DC Battery.